SIX SHOOTER RECORDS SIGNS THE WET SECRETS, INAUGURAL ALBERTA PEAK PERFORMANCE WINNERS. The ink is dry on a label deal with The Wet Secrets, Edmonton’s favourite furry shako <wikipedia> – hatted “frantic pop” rockers. Don’t let their impeccable tailoring suggest the band’s energy is anything so buttoned up – The Wet Secrets put on a helluvasweatyawesome live show wherever they go. The Wet Secrets have been a part of the Six Shooter world since the band’s debut, Rock Fantasy. Six Shooter Records is thrilled to be on board now as the full-fledged label/publisher worldwide for next release, The Tyranny of Objects, coming in the fall of 2015. 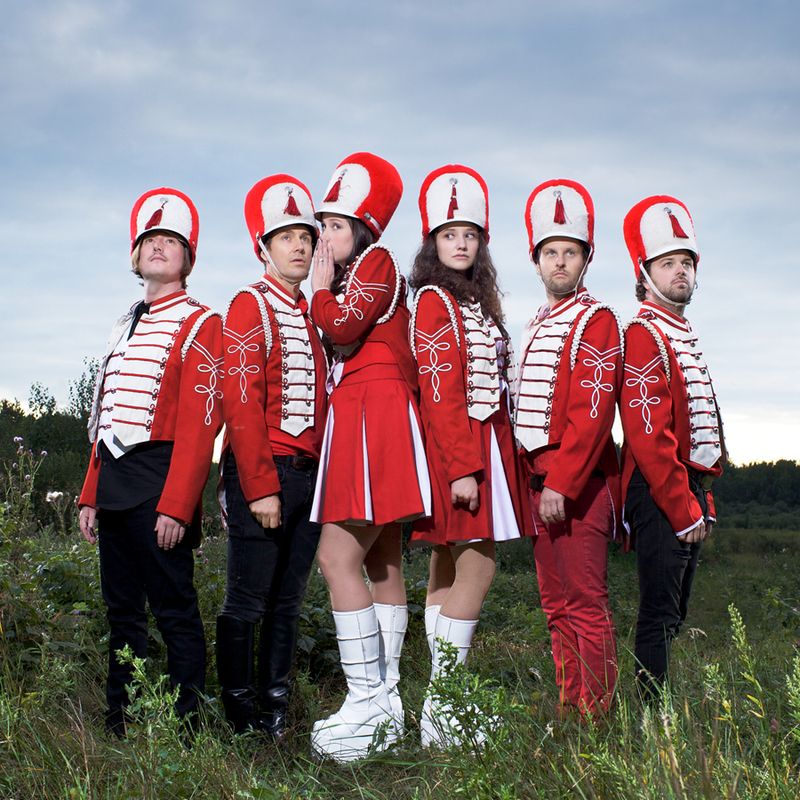 The Wet Secrets are also the newly minted winners of Alberta’s first ever Peak Performance Project, a lucrative battle of the bands that saw The Wet Secrets take it all with their brassy, brazen rock n’ roll dance music and marching band style. Demo Sneak Peek – “I Can Swing A Hammer,” from the forthcoming album The Tyranny of Objects. The Wet Secrets’ Six Shooter debut will be released in the Fall of 2015. A six-piece rock’n’roll dance band that plays the kind of music you could expect to hear if The Stranglers piggybacked Herb Alpert & the Tijuana Brass through the Rose Parade. Swampy basslines, primal drumming, dancing ladies with brassy hornstacks, keys, congas & vocal harmonies galore. Formed on a dare by Lyle Bell, Trevor Anderson and Kim Rackel, the bass and horn heavy quintet burst onto the scene with 2006’s A Whale of a Cow CD. Written and recorded within one week of the band’s formation, it was a clarion call to anyone within earshot that The Wet Secrets had arrived. 2007 saw the release of the fuzzed-up Rock Fantasy full-length. CBC Radio 3’s fervent support of the track “Secret March” landed the song at the #2 slot on the national CBC charts, won the band a Bucky, and brought on international acclaim. Festival touring soon followed, including mandatory stops at Austin’s SXSW and CMJ in New York, and the band played the opening slot at Edmonton’s inaugural Sonic Boom festival. Grant Lawrence of CBC Radio 3 named “Secret March” one of the “Top 20 Songs of the 2000s”.Free Candy is the long-awaited third album from Edmonton’s dapper pop primates. After a four-year hiatus spent focusing on other projects (Bell with Shout Out Out Out Out and Anderson with Dirt City Films), the band has reconvened and crafted a deceptively sunny new album, to be released independently on February 4, 2014. Free Candy marked a dramatic leap forward for the band in both songwriting and attitude. With the addition of local psych-pop wizard Paul Arnusch (Faunts/Whitsundays), wunderkind Emma Frazier and sax-master Christan Maslyk, The Wet Secrets have returned determined to seize the brass ring and stomp the world in the face/balls. (Figuratively/literally). This new resolve now comes with a more pensive pen, eschewing tongue-in-cheek ribaldry for a well-conceived quasi-concept album about death, disappointment, and doin’ it. Material with morillse gravitas perhaps, but still smartly dressed in the frantic pop trappings of The Wet Secrets. The Wet Secrets are the recent winners of the inaugural Peak Performance Project in Alberta. The Tyranny of Objects will be released in Fall of 2015 on Six Shooter Records. https://sixshooterrecords.com/2011/wp-content/uploads/2017/11/17-ssr-logo-home.png 0 0 Mejia https://sixshooterrecords.com/2011/wp-content/uploads/2017/11/17-ssr-logo-home.png Mejia2015-03-06 16:11:132015-03-06 18:09:21SIX SHOOTER RECORDS SIGNS THE WET SECRETS, INAUGURAL ALBERTA PEAK PERFORMANCE WINNERS.